Trigger Happy keeps on keeping on with all these trades we have! 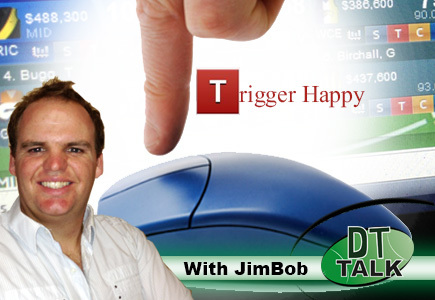 this week JimBob looks at options for Dangerfield and options for the all important F8 position. Also good to see JimBob be less lazy and answer some tweets for a change! While the boys have a week off and continue Swanning around Australia, some of us have to keep on keeping on…….. Trying to figure out who plays based on the Thursday teams is an equation that Mathematicians have not yet figured out. I think they are putting more effort into trying to figure out the last digit of Pi. Last week we had buddy missing a plane trip to Adelaide and Stokes a late out causing some people to actually eat a donut in their forward line. In round 16? This week doesn’t look any better with plenty of popular players missing through suspension/injury/other and I’m not too sure sure that Stokes will actually play this week. F8 has never been so important! With all the popular defenders at least being picked, there is no forced trades required down back this week. Poor bloody Dean Terlich. One bad score and every man and his dog jump off. People need to take into account that it was A) against Geelong at Skilled Stadium and B) Terrible conditions. Watch him burn you this week! Sam Colquhoun $102,700 b/e -39 – well isn’t this good timing? Colquhoun is back and on the bubble to make us some cash! no chance to get the vest as Kane Mitchell is also playing. Average J/S but who we have 44 trades to deal with that in the future. Jack Grimes $362,400 b/e 49 – Ol Grimey’ has got that 12 from round 6 out of his system and appears to be over the injury with back to back 90’s. pretty cheap for his potential output. Most coaches will be dealing with some sort of problem in the mids this week. Whether its Dangerfield, Cornes or Stevie J occupying a spot on the pine, there will be headaches. Scott Pendlebury, Brent Stanton and Joel Selwood are the most popular trades this week for Dangerfield and probably the top 3 trade in – options. Keeping with Tbetta’s theme of uniques, Ryan O’Keeffe ($529,600 b/e 111) is only in 6.6% of teams and has 5 tons in 5 weeks. If only I could afford him! Matthew Arnot ($108,500, b/e -40) is in a Sunday squad and on the bubble, but I’m not sure of his J/S coming to the pointy part of the season. While The blitz is the only ruck in the top 10 traded out this week, I would be wary of the dreadlocked one Nic Naitanui. There has been rumours out west that he has been playing sore for a while and may need a break (source). If he isn’t named today, I would be looking to trade him out straight away, his scores haven’t been that flash either. Bloody Stevie J. I love you for your 312 points last week, but then you get suspended? Frustrating much? It’s only a week and he should be held but has points hanging over his head and who knows how long the next one will be for, and at the wrong time of the season? It’s also that time of the season that Buddy went AWOL last year. Last week he only just missed the team, now he’s not named. Shall we run a sweepstake to guess when he will be back? What’s going on Buddy? Behind Danger, Buddy is the most traded out player this week and rightly so. Rockliff, Reiwoldt, Martin, Cloke and Roughead are all worthy ins but its Sam Mayes ($286,900, b/e -3) who takes my eye. Was probably in everyone’s team in round 6, then traded out about rd 9. Now he’s a legitimate chance to come back in! With scores of 88 and 99 in his last 2 weeks, he had 111 on Melbourne last time he played on them and projected to go up $30k this week. Handy cover for Stevie J for one week and makes some cash out of Buddy. Also has DPP so can slide into the mids at some point too. I apologise in advance for my lack of IT skill and my inability to do a screen shot for the tweets…..
Aidan ‏@awo9410h Asks Best def to get out of Ibbotson, Malceski and Enright? Steven Coyle ‏@sdcoyle Is it worth going sideways with Buddy to Rocky? Or should I spend the cash on an upgrade? First of all getting buddy out is a great idea and getting Rocky in is too. Rocky’s current value is below his potential and with Moloney out he should continue to score well. That’s why it’s the most popular trade this week. Haz Hannaford ‏@HHannaford If we don’t have any injuries or problems should we trade out cox to Kreuzer ?? While form suggests it could be a good trade, I would wait a week. If Naitanui is out for most of the season, then big Cox should rise again! He’s one of the best DT players in the history of the game, give him a chance to redeem himself! First of all, great call on holding Stevie J, especially if you have those 2 options as cover. Zorko had 120 on Melbourne last time, but Staker has been more consistent with 91 and 78 in his last 2. I would go Zorko over Staker for the ceiling, but either would be a good choice. Nice problem to have! Well that’s it for the week. Projected scores are getting higher and so are our expectations. 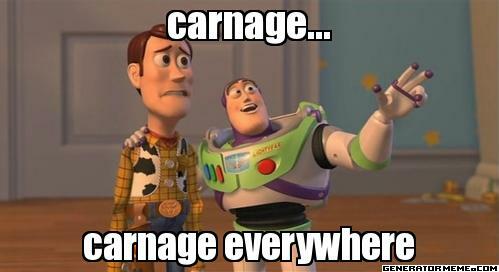 Let’s see what carnage comes our way this week! Also, a big thanks to all the blokes who came up and said hi last Thursday at the live show. It was a ripping night! Buddy > Martin. No point keeping non playing players. Do you really want no bench cover? What if Nic Nat is a late withdraw? enright and stanton would be my picks. Tough question, I like Lynch he has been playing very well lately, but Cloke has GC and GWS and should monster them both. I would prefer Terlich over Harlett though. Opt 1, just. should i trade out cox for kreuzer? No, Cox plays better without NicNat. so what do u think that he will get this week? Kreuzer averages low against NM. $85,900 Remaining. My first trade is Ellis-Grimes but not sure on second trade. I have $72,300 after the first trade. Thinking Buddy-Cloke but that would only give 3.5k left and wouldn’t allow me to upgrade Staker next week like I want to. I could also go Buddy-Mayes which would allow me to do the trades I want to next week but I would have to play Mayes this week. Thoughts guys? I’m thinking Deledio to Jelwood and Bicavs to Hall, Good trades or someone got a better suggestion? Is JJK a keeper? Or are people planning to trade him out before the end of the year? Staker of Mayes on the park? Probably should even upgrade Staker instead of getting Mayes but mayaswell wait for his BE to plateu.